Food safety especially the problems of microorganism pollution is always a nonnegotiable attribute in food trade, sales, and consumption. It is significant to detect the microorganisms including themselves, their crude excretion or their toxin, and so on that are possible to decrease the quality of food and increase the food safety risks. With the contributions of the progress in analytical chemistry and molecular biology, many kinds of technology satisfy the rapid detections of microorganisms with high specification and sensitivity. However, nucleic acid is a typical factor in these hazard exposures. In this review, we have reached up to a comprehensive representation of functional nucleic acid biosensors for detecting microorganism. Functional nucleic acid is one of the most vital biological micromolecules, indispensable for almost every life events of microorganisms and rich in all organisms. As for the research idea, highlight, and superiority of the functional nucleic acid biosensor for microorganisms, the sequence of nucleic acid is the important part where the information is taken from. From another point of view, DNA can be utilized as recognizing element and enzyme upon the specific structure to detect microorganisms. 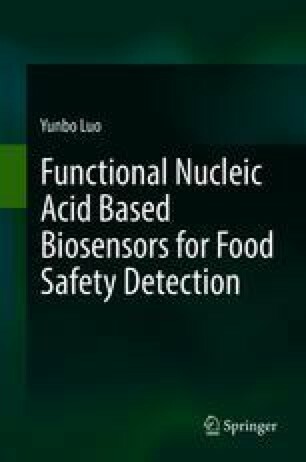 Therefore, it is shown obviously that functional nucleic acid biosensors can be efficient for detecting microorganisms, and research on it is becoming profound in microorganism detection. And this chapter will be nearly the most comprehensive description about functional nucleic acid-based biosensor for the microorganism detection.